Indulge me, dear reader, whilst I tell a tale…way back in the misty depths of history (or about 3 and a bit years ago!) I bought The Cult Of Dom Keller album ‘The Second Bardo’ from a label about which I knew nothing at the time – the name of that label was Cardinal Fuzz. I enjoyed that album so much I was moved to start this very blog and write a few words. 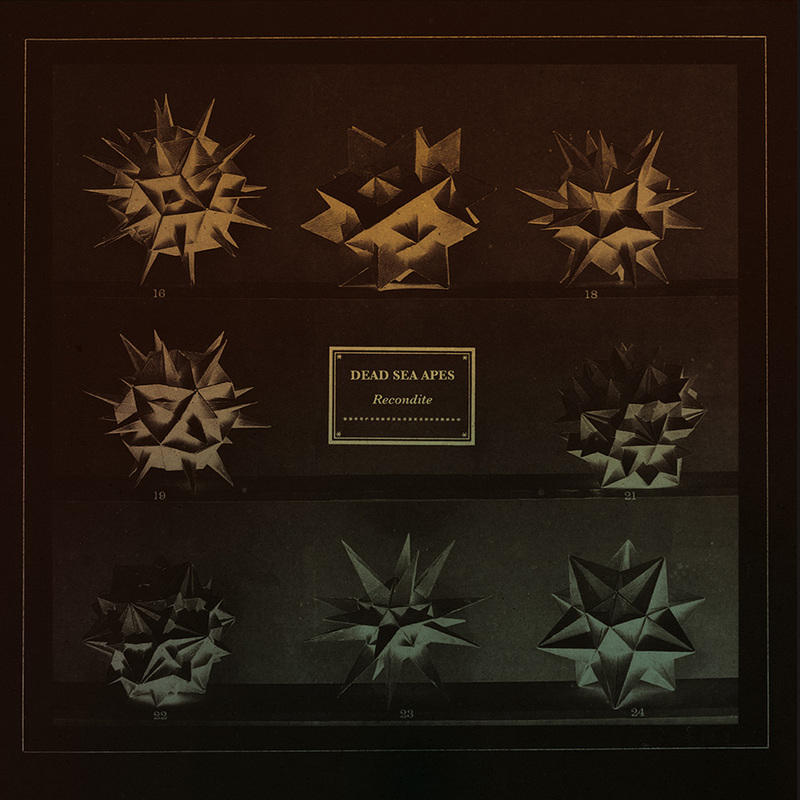 However, I didn’t want to jump straight in with a review so my very first post, the first ever Dayz of Purple and Orange post, was actually a YouTube video of a track called ‘Wreck’ by a band called Dead Sea Apes (from ‘Thermionic Emissions Vol 2’). Charged by both the CODK album and that DSA video I investigated further the rest of the Cardinal Fuzz site and, deciding to take a punt, ordered ‘Lupus’, already a couple of years old by then. The album duly arrived and now barely a week goes past without me listening to it – the start of a musical love affair that is still going strong. I have since snapped up all new releases and sought out past recordings – they are, without doubt, my favourite band and ‘Lupus’ would be my first ‘Desert Island’ choice. I still find that there is something evocative about the cinematic soundscapes the band conjure up on the album, the atmospheres they build…it moves me on an emotional level, as all truly good music should. The impressive discography of recordings only tells part of the story; aside from being active on the Manchester live circuit (both as headliners and supporting such luminaries as Agitation Free and Acid Mothers Temple amongst many others), the band have also contributed tracks to numerous compilations. Being the top blokes they are they don’t just retrieve some discarded track from the waste bin or randomly pick an album track, they contribute tracks that were recorded in ‘good faith’ but just didn’t fit the flow of an album and even bespoke recordings…something that Brett finds particularly gratifying “When it comes to ‘causes’, it angers me that we still live in a world where injustices can go ahead unimpeded or need isn’t met when we live in such an abundant world. If you can help out in some small way, then it feels good to be able to contribute. When it comes to compilations, as it is when there is a ‘cause’ attached, it’s actually really flattering to be asked and that people deem your music worthy enough to be held in the same regard as the other contributors”. The upshot is that there are loads of unique, uncollected DSA tracks scattered across the musicverse. Here enters ‘Recondite’. In a moment of inspired genius Cardinal Fuzz (working alongside Sunrise Ocean Bender in the States) have decided to collect these tracks on a monumental double album..a collection of alternate takes, cover versions and bespoke contributions. So, to the album itself. I’m never one for understatement when it comes to albums I like…I realise that…but ‘Recondite’ may not only have reframed the whole ethos behind ‘Compilations’ but be possibly one the greatest comps ever…every track is a bona fide classic and the collection leaves one slack-jawed with admiration. Kicking off with ‘Tentacles (version)’ – an alternate take on the track that appears on ‘Sixth Side Of The Pentagon’ featuring Adam Stone. Menacing electronica and slices of huge, cavernous dub providing the perfect backdrop for Stone’s deadpan intoning. It’s longer than the album version and the dub sounds deeper and the whole vibe a lot more threatening. ‘Coronal’ originally appeared on the Cardinal Fuzz ‘Stay Holy’ compilation and is an iridescent beauty, shimmering guitars weaving a sonic tapestry of colours and textures and captures perfectly their ability to create aural landscapes and paint pictures in the air. A track that takes the structure of post-rock but overlays it with a rich spacey atmosphere and the unstoppable rhythm of krautrock…an absolute gem! ‘Planet V’ holds a very special place for me on a personal level…when I was putting together my first Dayz Of Purple and Hope compilation (a charity comp with proceeds going to cancer research charities following my late mother’s diagnosis of terminal cancer) I approached the guys and this is the track they kindly donated and as you can imagine it fills me with great pride to see it appear on ‘Recondite’. The track itself is deeply rooted in psychedelic krautrock with Brett’s guitar positively weeping crystal tears. The connection I have with the track and its associations makes this an emotional listen and I’m not afraid to say that it moves me to tears. ‘True Believers (version)’ is taken from the ace Evil Hoodoo ‘For Nepal’ album, the original version appearing on ‘Spectral Domain’. It is ostensibly simple but effective guitar ringing out over a solid bassline and drums, the tension and the fear palpable in the atmosphere it creates but this version grows in size..the guitar becoming megalithic in proportions and some of the riffs threaten to engulf the cosmos. ‘Land Of The Sun (featuring Gabriel Minnikin)’ is a cover of the Alexander ‘Skip’ Spence song and appeared on the Fruits De Mer ‘Keep Off The Grass’ compilation. I’ll be perfectly honest and admit I have no idea who Gabriel Minnikin is but what I do know is that this a huge track. The tell tale DSA sound seems to have been magnified and the Tom Waits like growl of Minnikin (I’m assuming it is him on vocals) adds a whole other dimension. This is the only track on the album I had never heard previously and it is a belter. ‘The Recognition’ comes from the fantastic Sky Lantern Records ‘Stand With Standing Rock’ compilation, released in support of the Standing Rock protests against the Dakota Access oil pipeline.. It is a mournful epic that beautifully expresses the sadness and disillusionment that surrounded that dark moment in US history (the building of an oil pipeline that threatened the region’s clean water and ancient burial grounds.) Very much post-rock in both feel and structure and the addition of violin (courtesy of the multi-talented Mr Hardman) is a touch of melancholy genius. ‘Universal Translator’ is taken from ‘Paper Leaves’, another beautifully curated compilation that commemorates 30 years of the ‘Ptolemaic Terrascope’ magazine and ‘Terrascope Online’. Ostensibly a ‘work-in-progress’ version of ‘Universal Interrogator’ from ‘Spectral Domain’, it is classic Dead Sea Apes with that recognisable ‘spaghetti western meets Neu!’ – all drones and tribalistic drumming, conjuring up a sun-baked aridness. The shamanistic motorik drum beat is complemented by the guitar adding shape and texture to this soundscape, knife sharp at times, at others heavy and fuzzy. Most people with recognise ‘Lupine Wavelength’ coming as it does from the ace ‘Magnetic North’ (Drone Rock Records) a 4-way split LP also featuring Blown Out, Earthling Society and Vert:X. A lush workout that sparkles with psychedelic goodness…it is a band at the very top of their game – Brett’s guitar veering between crystalline psych and heavy stoner fuzziness, Nick’s looping basslines and Chris’s drums providing a solid backdrop. Possibly one of my favourite tracks ever. A band never to shy away from a challenge, they take on ‘Rückstoss Gondolière’, one of Kraftwerk’s less well known tracks. It originally appeared on the 2012 Fruits De Mer album ‘Head Music’. It is a kosmische gem that pays due respect to the Teutonic legends…..atmospheric, hazily beautiful and delightfully trippy in a very krautrock way. ‘Rethreads’ sees the band indulge in their more experimental tendencies, it is essentially a backwards dub mix of ‘Threads’ (from ‘High Evolutionary’) made using a 4-track cassette recorder and a guitar reverb pedal. It is remarkably effective and stands alone in the DSA canon…relying on technology and an inherent sense of what makes good music. It is dark, disturbing and exceptional. It appeared on the recently released cassette ‘Music from The Dark Outside volume 1’ from The Dark Outside, an annual 24-hour broadcast of unique music in the Galloway Forest Dark Skies Park. That slice of darkness is followed by ‘Vamos Compañeros’ from ‘Kosmische Musik’ (The Blog That Celebrates Itself)…a cover of the Harmonia track. It is an absolute belter, full of repetition based krautrock stylings – a motorik rhythm, shimmering electronica and some guitar that positively hums with fuzziness…worth the admission price on its own. My overall impression of ‘Recondite’, apart from the majestic music therein, is the scope and breadth of Dead Sea Apes’ music…I’ve made allusion to the ‘trademark’ sound a couple of times above but that goes nowhere near summing up the band’s body of work. They turn their collective hand to psych, krautrock, dub, stoner and experimental and all points between with equal ease and skill. The level of musicianship is matched only by the creative spectrum they cover. Even this does not explain why they have such an allure to myself and others….they have an air of accessibility about them, that feeling that they recorded the music just for us..as friends and comrades in this fucked up world in which we live. This was confirmed with the release of ‘Sixth Side Of The Pentagon’ and the ‘In The Year 2039’ 12″ with Adam Stone…they are fighting the same things as us, worried about the same issues and have the same fears. No ‘rock’n’roll’ pretensions, no hissy fits or pseudo-glamorous posturing..just three blokes playing some of the best music you will hear. ‘Recondite’ is simply fantastic and THE essential purchase of the year. It brings together all those tracks that you may have missed…and unusually for a compilation of this type, it really is all killer with absolutely no filler. It is released by Cardinal Fuzz as a double album and can be purchased here (but I’m guessing by the time this is posted it would have sold out). The vveritable Sunrise Ocean Bender will be handling things stateside here. A download version will be available on release via the band’s bandcamp page here. On a sadder note, it has just been announced that Nick has left the band to concentrate on his new coffee business. Dayz of Purple wishes Nick all the very best with his new venture…he has left big shoes to fill. For the band…onwards and upwards!